Tricks and stunts that are playful, funny and exciting. Holder of the $10,000 hat! 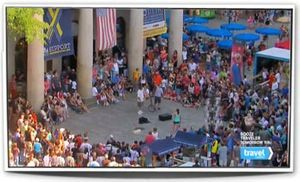 In August 2013 the Travel Channel secretly filmed the street performers of Boston, Massachusetts and after some expert consideration Groovy Guy was judged to be the best. 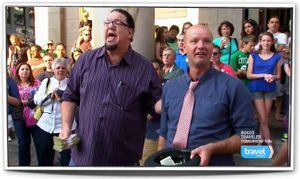 As a prize Penn Jillette dropped $10,000 into Groovy Guy's hat. This was subsequently broadcast as "Street Cred" and you can watch the good bits by clicking the link below. 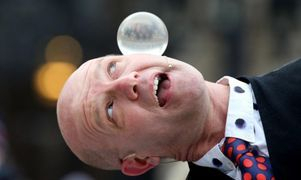 As a teenager Guy started out by juggling three balls on the streets of Paris and he has grown up to become and international street performing sensation. A regular at Covent Garden Market, London; Faneuil Hall, Boston and the Edinburgh Fringe, Scotland plus numerous street festivals across Canada, Australia, Europe and even the Middle East. Guy Collins is "The Groovy Guy". The pavement becomes his stage and everyone can join in the fun! 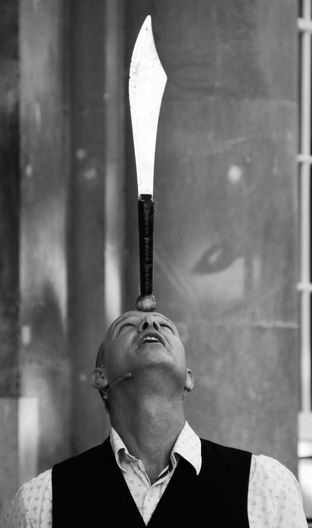 Be wowed by extraordinary juggling tricks and improbable feats of balance. 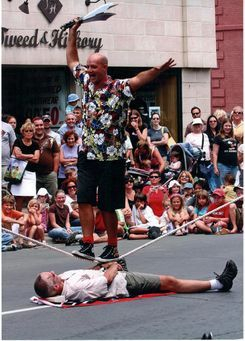 Rope walking whilst juggling knives, a big unicycle and spectacular fire juggling. Groovy Guy's positive energy and humour have a magical effect upon his crowds and produce much cheering and laughter.